It's curious that energy hasn't been as big an issue in this year's presidential campaign as it was in 2008, the year of "Drill, baby, drill." The price of unleaded regular gasoline has averaged roughly a dime per gallon higher through September than either last year or the same period in 2008, when prices peaked at $4.11 per gallon in July. Gas prices are higher this year because global oil prices are also higher, with UK Brent crude averaging $15 per barrel over its 2008 full-year average, though without a similar spike. 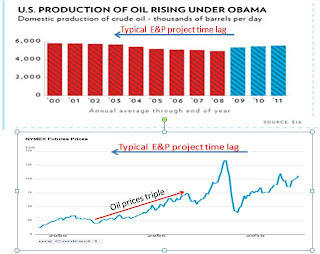 One explanation for the reduced focus on energy is that President Obama co-opted his opponents' "all of the above" prescription, while indicators such as US crude oil production and natural gas output and prices have been moving in favorable directions. The Obama campaign and key administration officials routinely draw a strong causal connection between those two facts, forming the basis of their campaign on energy. But is that claim true? Like the Washington Post fact checker's assessment of another frequent presidential assertion about energy, a finding of "true but false" seems appropriate. Although I had intended to provide a side-by-side comparison of President Obama's and Governor Romney's energy agendas, it quickly became obvious that that was impractical, due to length and complexity. I'll take a look at the challenger's ideas next week. Since any re-election bid is fundamentally a referendum on the incumbent, it made sense to start with the record of an administration that came into office with an unusually clear and clearly articulated vision on energy, experienced some notable victories and defeats along the way, and ended up embracing a pair of big, emerging trends that it had done virtually nothing to foster. 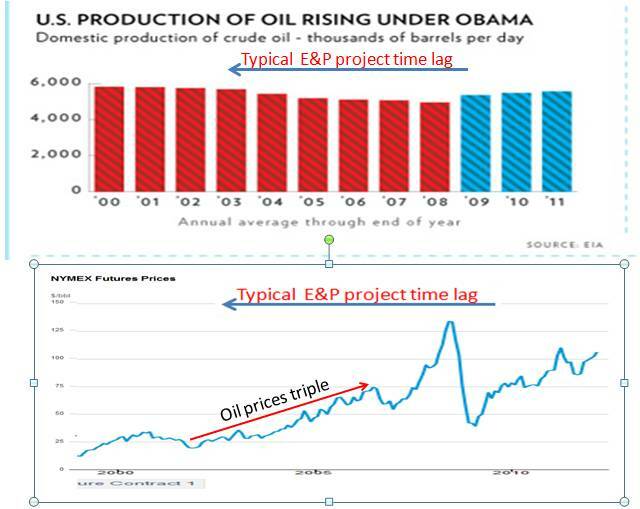 Most oil projects big enough to matter aren't accomplished overnight. The process typically involves acquiring onshore or offshore leases, obtaining the necessary permits, conducting exploration activities that only proceed to the next step based on success, planning the required production wells and processing facilities, competing for internal funding against other company projects, obtaining additional permits, constructing facilities and drilling the production wells. Every step takes time. Depending on the complexity of the project, the overall timeline can span from three to seven years, and that's if no one sues to block the project. 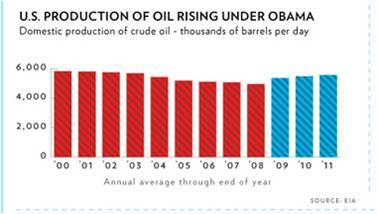 To see why oil production has been rising since 2009, we need to ask what was happening in 2003-6. The answer is that after many years of being stuck in a range of $20-30 per barrel--with an excursion down to single digits in the late 1990s--oil prices tripled during that period, mainly due to the combination of global economic growth, especially in Asia, and the lagged effect on oil project investments from that late-'90s price crash. In other words, production went up mainly because five or six years earlier the financial rewards for drilling suddenly got much bigger. In fact, the President's adoption of "all of the above" is fairly recent, making headlines following his 2012 State of the Union. It represents quite an evolution from Senator Obama's 2008 emphasis on renewable energy and climate change mitigation. President Obama certainly pursued those agendas with vigor, incorporating billions of dollars of federal grants and loan guarantees for renewables in the 2009 stimulus, backing the Waxman-Markey cap-and-trade bill, and at both the Copenhagen and Cancun UN climate conferences committing the US to significant greenhouse gas reduction targets and further negotiations. It hasn't all worked out as planned, though. Notwithstanding the high-profile bankruptcies of Solyndra--a colossal failure of due diligence by the administration--and other loan guarantee and grant beneficiaries, the output of wind, solar and other non-hydro renewable energy generation has indeed grown by 55% since 2008, increasing from 3.1% to 4.7% of total US electricity generation, equivalent to 1.9% of total energy consumption. Yet sadly the wind and solar manufacturing sectors that were to have produced so many "green jobs" are caught up in parallel waves of excess global production capacity that could take years--or wrenching consolidation--to work off. The overcapacity that has blighted the prospects of many of these companies is largely attributable to the generous incentives provided by the US and other governments from Europe to Asia. Direct wind and solar jobs accounted for just 54,000 of the US "clean economy jobs" tallied by Brookings and Battelle in their study last year, and they look no more secure than non-green jobs. Climate policy is another area featuring a big disconnect between effort and results. With control of both Houses of Congress, the President backed a climate bill that exhibited all the worst tendencies of that body: 1,092 pages of bloated regulations and carve-outs for favored constituencies. Even to someone who had supported the idea of cap and trade for a decade, it was a dog's breakfast, configured mainly as a production-inhibiting tax on the US petroleum sector. Waxman-Markey failed to pass the Senate, and a more bi-partisan bill died in the aftermath of Deepwater Horizon and the recession. Whatever one's views on the science of climate change, costly climate legislation looked like a bad bet in a weak economy. Actual emissions have fallen, however, as a result not of policy but of another trend that wasn't on the administration's radar screen until it grew too large to ignore: shale gas. Emissions are at a 20-year low, mainly due to fuel switching from coal to cheap natural gas in the utility sector. Another key trend cited as evidence of the effectiveness of the administration's energy policies is the reduction of oil imports that has occurred since 2008. Yet like the facts on oil production, the causes are only tenuously connected to those policies. From 2008-11, US net petroleum imports fell by 2.6 million bbl/day (MBD), including refined products. That goes a long way toward achieving then-candidate Obama's goal of reducing imports by an amount equivalent to what the US imported from the Middle East and Venezuela. However, the biggest contributor to this reduction was the 1.1 MBD increase in total US petroleum production (including natural gas liquids), followed by a 0.6 MBD drop in demand that had more to do with reduced driving and the weak economy than the early gains from tougher fuel economy rules. Increasing biofuel production associated with the 2007 Renewable Fuel Standard contributed another 0.3 MBD, although that policy now stands in urgent need of reform. I have watched many elections in my life, and I can't honestly say I'm surprised to see an administration running on something other than its actual energy record, which in this case includes positives such as funding ARPA-E's potentially transformational energy R&D and having enough sense to keep largely out of the way of the shale gas revolution--at least for now. Yet having focused 90% of its efforts on a set of technologies that look important for the future but will still meet less than 10% of our energy needs for some time to come, they have now hitched their electoral wagon to an oil production surge that they didn't help and partly hindered. I can only imagine that this would be deeply disappointing to those who supported Mr. Obama in 2008 because of his vision for alternative energy and the environment. Nor does it provide much comfort to those who found large portions of that agenda ill-considered or premature. The President's 11th-hour conversion to "all of the above" creates great uncertainty about the course he would pursue with regard to energy for the next four years, if reelected. I suspect most of us, yourself included, are actually pretty certain about President Obama's likely energy policy in a second term. However, those of us in a position to make major investment in new energy facilities are not certain enough to make those investments. I would not invest in a new coal-fired electric generation facility or a new coal mine, or even in expansion of rail facilities to move coal to market. 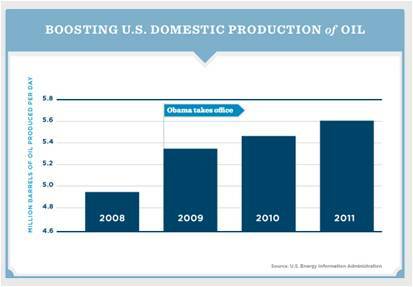 EPA is far from done with coal, if President Obama is re-elected. I also would not make major investments in shale gas wells, or gas-fired electric generation, or gas pipeline capacity to move the gas to market, since EPA has not yet announced how it will regulate fracking to frustrate shale gas production. I also would avoid massive new investments in tar sands production and the pipeline capacity to move the oil to market. Nature abhors a vacuum. The Obama Administration, however, appears to wish to exist in a vacuum. Energy investment will remain feeble until the risks of adverse legislation and regulation are more clearly understood. Attempts to destroy existing energy investment, however, will proceed vigorously.